"I have always thought of Christmas time as a good time; a kind, forgiving, charitable, pleasant time; the only time of, in the long calendar of the year, when men and women seem by one consent to open their shut-up hearts freely." Did you make the ornament in the photo? I got some directions to make them - I think they are beautiful and am hoping to get the supplies to make them for people for next Christmas. If you made them were they hard? I've made the ornaments years ago and they are simply beautiful but somehow I think I've lost the directions over the years. May you have a rich and joy filled Christmas. That's a fun quilt ornament. It's making me wonder how it's done. We used to make a crazy quilt one, which was so much easier than it looked, but this looks complicated. I've always liked that quote. This ornament is one from my aunt's Christmas tree, so I didn't make it. But, I have made hot pads and cushions using the same method. It's really quite simple. Mostly is it folding and overlapping fabrics. The finished effect looks much more complicated than the finished product. It was really fun to do! 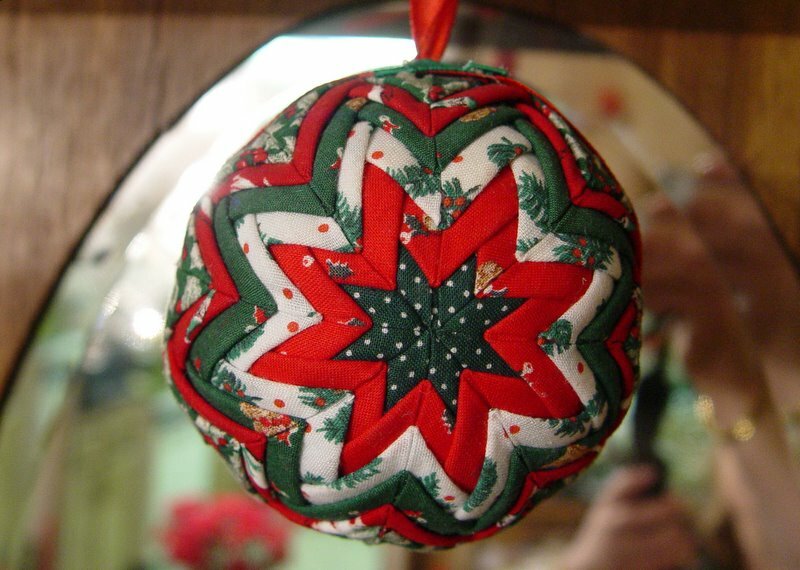 Lisa, how neat to have found the pattern for this folded star design for ornaments.